Comments: Martin E.P. 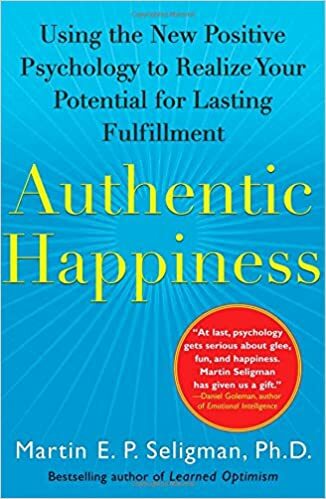 Seligman is the father of positive psychology and his book lived up to expectations. I didn’t find it “ground breaking” and that’s thanks to having read many a happiness book that builds on Seligman’s ground break findings. The only miss is the lack of a “framework” in the book. I remember it as a collection of great anecdotes, many of which I’m sure to write about. I’ve always maintained that great books give you a framework in which to remember the key learnings – e.g. the 7 habits of highly effective people by Stephen Covey. 1. Two groups of school kids were studied for their happiness level. Group I involved the geeky kids who studied hard, attended various classes after school and played hard. Group II involved the “cool” kids who hung out in the mall. It was found that the geeky kids tested happier on every aspect except one – they thought the kids in the mall were happier. 3. Expressing anger and negative emotions does NOT help – contrary to popular belief.